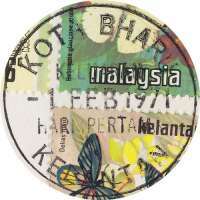 On 1 February 1971 new sets of low value stamps were issued for use in the individual States, replacing the previous Birds and Orchids stamp issue. 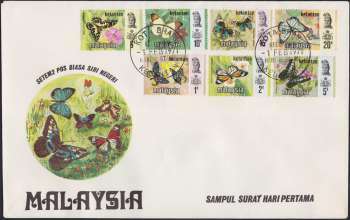 The new stamps featured Malaysian butterflies on all values and were printed by Bradbury Wilkinson. The designs were by Victor Whiteley, depicting the butterflies against their natural food sources. First day covers, which contained a descriptive insert in English and Bahasa (Malay), describing the issue in detail, were produced and serviced by the Post Office. Each individual Malaysian state had seven values, which were identical for the same value with the exception of the state name, ruler’s portrait where relevant and the state crest. The 13 States were Johore, Kedah, Kelantan, Malacca, Negri Sembilan, Pahang, Penang, Perak, Perlis, Sabah, Sarawak, Selangor and Trengganu.